At Kali we have one priority above all - we want to make anything we manufacture as safe as possible. 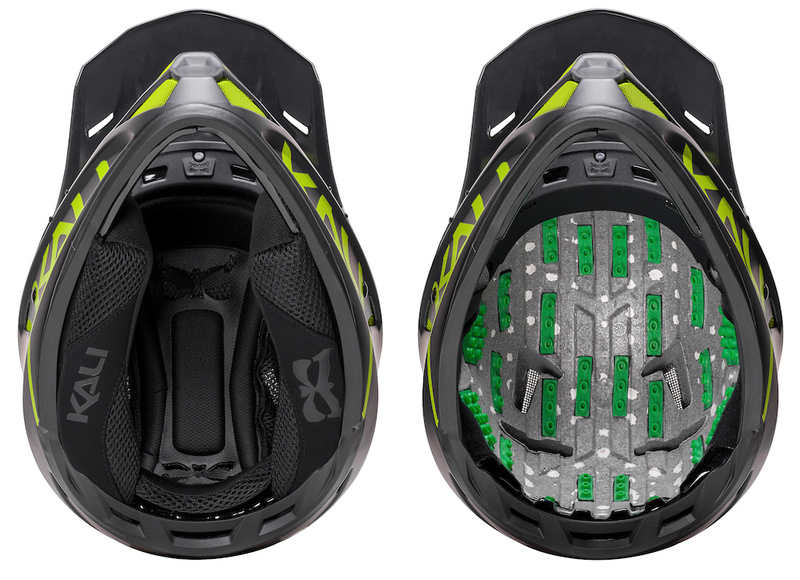 Where advancements in helmet safety can be made, we make them. This has been the precedent from day one - innovation was the foundation for Kali's inception. Our core technology, Composite Fusion, was the result of over 3 years of R&D and tooling, well before we even produced our first helmet. Composite Fusion is the DNA found in all of our helmets - it allows us to make them smaller yet lighter and stronger. How do we measure our success? By consistently implementing development strategies that address the challenges behind reducing brain injuries. We collect, analyze and share as much helmet crash performance data as possible. We do whatever it takes, using any and all available proven technologies to ensure our helmets continue to lead the way. Linear concussions are the result of direct impacts that stop the head moving forward. Your brain, however, continues moving and collides with the interior of the skull, causing damage to either the frontal lobe or occipital lobe, or both. 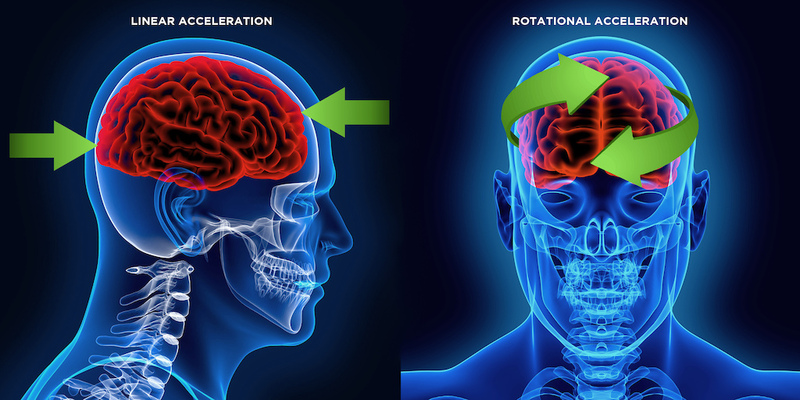 Rotational concussions result from lateral (oblique) impacts that spin the brain on its axis causing brain structures to tear. Much of what we have learned over the past decade of developing helmet technology can be reduced to one basic principle: A smaller helmet is a shorter lever on your head. If a larger helmet means a longer distance from the center of your brain to the end of the lever, then the impact area (read trail) that touches the helmet exerts greater acceleration forces on your brain. A smaller helmet means less of a lever arm on your head requiring more force to spin your brain. A reduction in the potential for TBI and MTBI can be achieved with a reduction in linear and rotational acceleration forces on your brain when you crash. Smaller and lighter helmets with LDL rotational technology. Angular (oblique) impacts are still not accounted for consistently by current helmet standards. Most accredited test labs assume a consistent 90-degree linear impact condition, completely omitting rotational acceleration. Impact reconstructions are few and far between which leaves researchers with little data to help identify the most common and therefore preventable crashes. Linear and rotational concussions occur in both high and low G impact scenarios. Current helmet standards only account for high G linear, or catastrophic impacts. 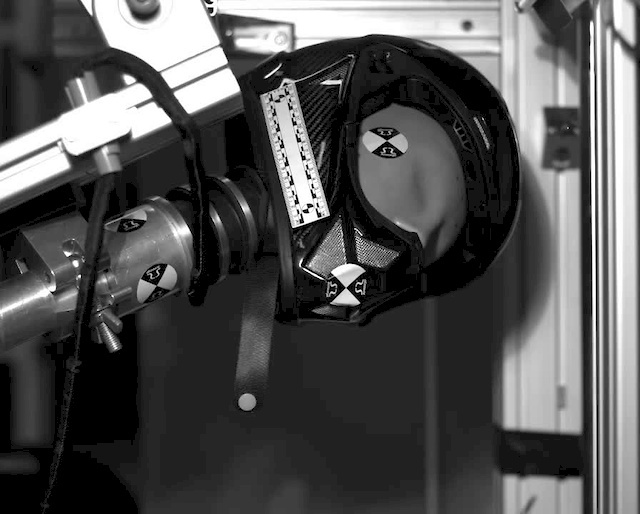 These standards mandate that the foam helmet liners that we place next to our heads need to be very hard in order to pass catastrophic level impact testing. We also know that repeated low G impacts contribute to neurodegenerative problems (brain damage), such as chronic traumatic encephalopathy (CTE). Traditional EPS liners do not protect against brain damage at low speeds (2 - 4m/s) or brain rotation at any speed (although Composite Fusion lowers impact forces by virtue of helmet size and weight reduction - a shorter lever on your head). 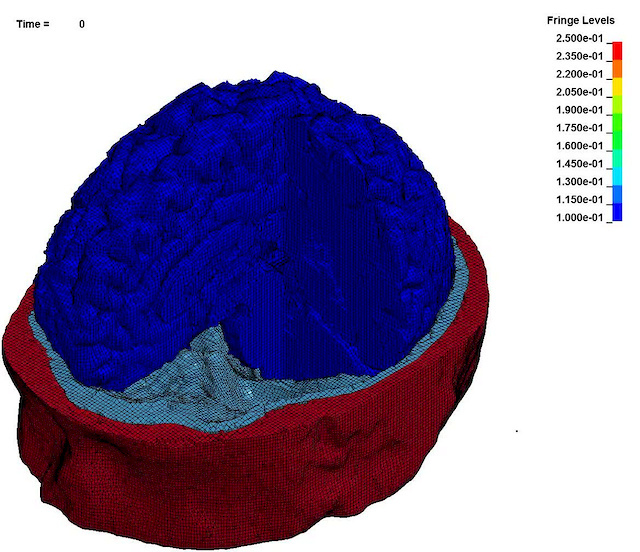 Research shows that there is an 80% chance of Mild Traumatic Brain Injury at 106 G, yet the current standards require an impact force reduction to only 275 - 400 G.
Kali’s omnidirectional impact technology, LDL (Low Density Layer), is our proprietary design and implementation of a viscoelastic material made by Armourgel. Armourgel has an open cell structure that gives breathability and flexibility, absorbs and dissipates energy at high and low speeds and can take repeat impacts without any loss of performance. 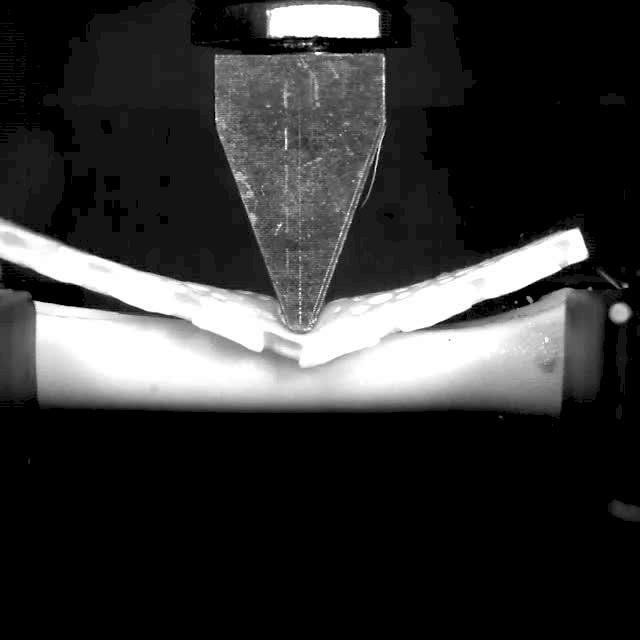 Below is lab footage from Armourgel showing a bone snap test using an impact anvil - with and without Armourgel. Placed between the hard foam liner of the helmet and the wearer's head, LDL strips are distributed throughout the helmet to ensure maximum airflow and comfort. Their primary function, however, is to react to multiple-vector linear and rotational acceleration. LDL has multiple-vector elasticity - that is, LDL responds by stretching under pressure from a variety of different directions and force levels. Armourgel started testing Kali's Shiva full face with and without LDL in rotational impact lab conditions in 2014. Shivas without LDL were Reference helmets, and Shivas equipped with LDL were classed as Advanced Liners. A guided falling mass with a 30° impact wedge was used to test up to 10 m/s. A cantilevered mass was built to mimic the effect of a body mass, and an instrumented Hybrid III head form was attached to the body mass. The use of high-speed video enables correlation of head form kinematics with helmet position. the LDL Advanced Liner in comparison to the Shiva Reference group. ■ Comparing the Shiva Reference helmets with the Shiva LDL Advanced Liner helmets, the LDL equipped helmets experienced up to a 30% reduction in peak linear acceleration. ■ Overall, researchers found a resultant potential to reduce the probability of MTBI from up to 60% down to 10% using an LDL equipped Shiva. 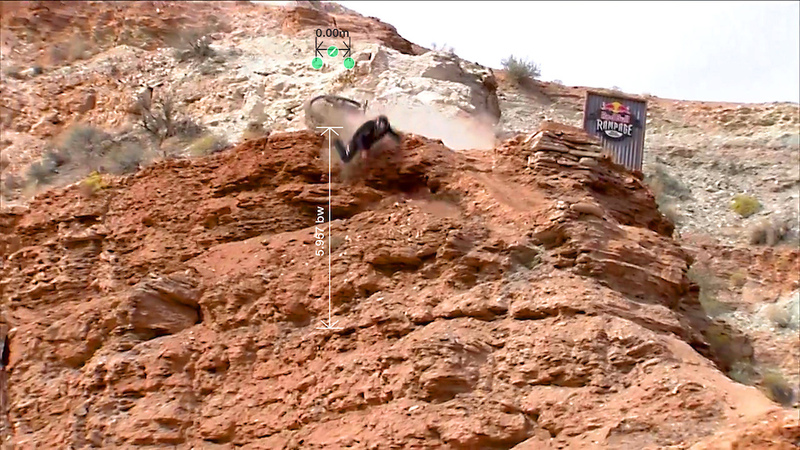 Nicholi Rogatkin's legendary 2015 Red Bull Rampage run has to be seen to be believed. The fact that he rode away is a testament to his athleticism and a very healthy dose of luck. Rogatkin was the first Kali rider to run a Shiva with LDL, a resultant prototype from the 2014 Armourgel rotational LDL tests. Our CEO and lead engineer Brad Waldron glued the strips into Nicholi's Shiva by hand a couple of months before Rampage. Armourgel reconstructed Rogatkin's crash in their test facility, replicating it as accurately as possible, and then compared his real world crash data with the 2014 Shiva LDL oblique impact findings. Thanks to their lab techs, we now have two sets of oblique impact data to compare: the pre-crash Shiva LDL test data, and the dataset from the reconstruction of Rogatkin's crash. The crash data was used to create a controlled impact test that measured both linear and rotational acceleration. Angle and position were adjusted to emulate the Rampage crash exactly. The speed was derived from video footage and screenshot analysis. All rotational testing (before and after the Rampage crash) was administered in the same lab, on the same test instruments, by the same operators. Check the math out here. 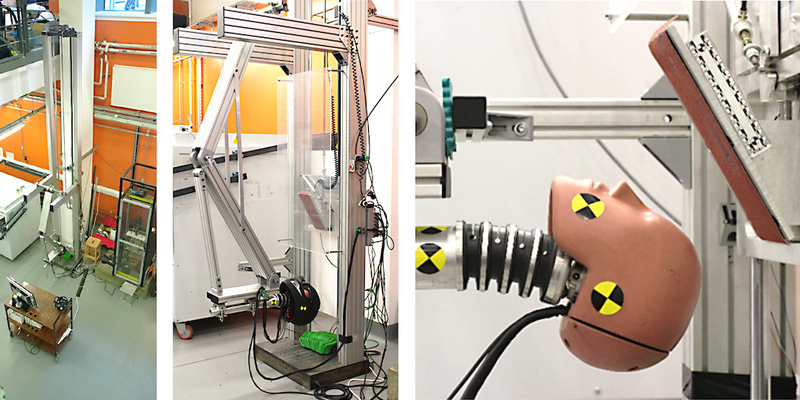 ■ In the Armourgel lab 6.1 m/s crash reconstruction impact tests, researchers found a 24% reduction in peak linear acceleration (120g – 98g) and 20% reduction in peak rotational acceleration. Significant results in a test lab are encouraging, and indicate that our development strategies are moving in the right direction. There is, of course, no substitute for real world evidence. Two-wheeled accidents are a reality, and although we never want anyone to actually crash, real word data is critical to making better helmets. We are in this case very fortunate to be able to learn from Nicholi. His and other crashed helmets are invaluable contributors to evaluating Kali's helmet performance. Acquiring accurate data is a big part a why we offer a Lifetime Crash Replacement policy. The steady stream of crashed helmets we receive are a wealth of knowledge. We want to see how they've held up out in the real world, and it allows us to carefully try and predict how our helmets will perform. We then adjust our engineering and development program based on what we learn. One of the raddest guys ever, Cedar Keyes, is the Kali Road Warrior. Cedar travels up and down the West Coast, providing race and event support with demo helmets, and he manages to collect crashed helmets for our test lab. What's next? We can say that we have compelling performance data from both LDL test lab impacts and a real world crash reconstruction. We know that LDL can actively reduce the effects of both linear and rotational acceleration. We are confident enough in the effectiveness of LDL that it will come as standard equipment in Kali helmets as of 2019. So at first glance this looks very encouraging. I spent 2 years trying to independently analyse neck braces for efficacy. Despite good theoretical testing and promising biomechanical data, it taught me that despite companies telling consumers that they have developed tests which give us irrefutable evidence of how good their products are, they still set out on their course from a direct conflict of interest. None of this research happens unless they sell products and it can't be adequately repeated and reproduced due to a lack of peer review. If the goal is to keep users safe as opposed to pure profit gain, as helmet makers are so far ahead of the curve they need to develop a cross brand standard which their products are held to. This doesn't mean I don't support Kali's efforts and it is highly refreshing to see something along the lines of evidence base and good science presented to consumers as opposed to acronyms and slick advertising, but there needs to be an industry wide approach if CE and DOT are not at a suitable independent testing standard. What happened to neck braces? I was talking to friends about this, a few years ago everyone was wearing them and talking about them, now I rarely see one. Was it found they caused more injuries than saved (broken collar bones)? Were they marketing hoey? @Rasterman: The theory behind their development is sound. They actually don't cause load transfer to collarbones. Load transfer is to the torso via the pectoral muscles/sternum, trapezius muscles and thoracic spine. Cadaveric and mechanical testing from Leatt and Alpinestars demonstrates reduced risk of unstable C spine injury in compression and hyperextension. Incidence of lower thoracic vertebral injury is under examined but a potential risk. I wear one though if that is of any value. @Rasterman: Not enough stuff like this published and the price. I don't doubt that neck braces work, but no matter how good they are if you don't have £250-£400 to spend on one then you can't benefit. Just like most riders don't wear D3 helmets there need to be braces in the £100-150 range. Also Leatt and Alpinstars need to put out more stuff like this, show us the crash test dummies getting smashed into stuff, the graphs, the numbers, explain exactly what they mean, what they do and what they don't protect against. Lack of (non hyperbolic) information has been a real problem for neck braces. @thestigmk1: they've been tested by a university once for the french motorcycle federation as they wanted to know if they should make them obligatory or not. They are not, so I let you guess the results: they were mixed. Particularly for those like Leatt which rest on the spine. Those resting on the shoulder blade had better scores, but not tremendous. @EnduroManiac: all recent Leatt brace models (last few years I think) have a split back plate that does not rest on the spine. @Rasterman: Although it's been 3-years, I am confident that I am still here today for the fact that I was wearing a Leatt Brace and a D3 Helmet in Whistler. Yes, the collar bone broke, along with the elbow, hand, and numerous ribs, but considering I cracked a new D3 carbon helmet in 2 locations, I am pretty sure the helmet, combined with the neck brace, prevented a broken neck/spinal cord injury. One of those items that you never know you will need, until you need it!! @one38: the study I talk about is a few years old now. Possibly 4-5 already. Australia has one of the most stringent certification laws in the world re what testing has to be done and passed before helmet companies are allowed to sell here, including drop and wedge testing, whilst it might result in slightly higher prices for helmets you also know that the silver certification means that the helmet will do what it is supposed to do. protect your skull. @Hooch73: Yes but standards are not what actually lessen injuries to people. They are a meta-approach. Research and testing, whether independent, corporate or government sponsored provide the data to create safer products. Standards follow. I applaud anyone who does good practice in-house testing and releases the information. @Rasterman: I have a long neck. Every time I crash and my neck is levered/bent, accelerated or decelerated I get a sore neck. This is hundreds of times over my life. I have lots of radiological evidence of this damage. When I wear my brace that pain is lessened. The same crash scenarios have been repeated many times through my riding life so I am quite sure of this. I only ride without my brace when I forget to take it. I use the older Leatt Pro Carbon which is taller - better for longer necks. I remember when people used to say it was safer to not wear a seat belt in a car because people were sometimes saved by being thrown out in an accident before the car went over a cliff or burned or sank. During that period far, far more people died simply going through the windscreen in a head on or nose to tail. Wearing a brace for me is like a seat belt...it helps. Love my Interceptor and both my sons ride with Mayas. I trust Kali to protect my kids. When the Maya incorporates the LDL, we'll upgrade. I don't believe it's just marketing and although they do need to sell, I think they are truly dedicated to protecting our noggins. And I've taken advantage of the crash replacement. Thank you Kali. Would be curious to hear what Kali's take on this? I ask as I've had multiple concussion, from crashing me car once and bike many many times. Long term brain health is something as a rider I'm trying learn, understand and protect. Also why I don't go cheap on helmets. Brilliant video - what he states re: today's testing standards being focused on skull fractures vs concussions is bang on. Slowing the movement of the brain to be more in sync with the movement of the head using a softer material between the hard eps foam of standard helmets and your head also makes a ton of sense to us. Everyone should watch this, thanks for sharing! Would be great to get brad to come in... I have read this transcript before. Seems like Kali is following this concept in the design of their helmets very closely. @KaliProtectives: Thank you for responding to comments and links on this article. This give me a huge amount of confidence that you are working devices that preserve peoples health, but also listening to the people who use your product and not just hiding away in your labs. This, coupled with your helmet exchange programs and even at Sea Otter last year, where you swapping people's helmets with your own, plus your pricing, shows to me that you are in this for the long haul, but you care about your helmets and how they perform. And not caring so much on hype and commercial gain. Plus your helmets fit my head! Good on you and thank you. @KaliProtectives: First of all, thank you for both educating us as well as actually pushing the safety of helmets on a very fundamental level. Inspiring! I had my fair share of concussions though not necessarily all of them from riding bikes. The first one was from being hit by a car straight to my jaw so there was definitely some rotation involved. That was at the age of 9. Maybe time spent in the mosh pit at metal concerts wasn't too great either. According to my surroundings that first concussion triggered my ADHD symptoms. It definitely is the "fun" disorder at times and I can't imagine myself without it, but yet at the same time it can be limiting when attempting complex stuff at school or work. I always thought these little kids with their huge full face helmets could shear their heads straight off when they crash, they might be better off without a helmet! So good on you for producing proper small full face helmets. Then again I thought I'd never get a good helmet fit because of all my hair. But maybe that actually saved me. I usually stow it in a bandana to make it easier to cram it in my helmet. But apparently that might have worked as a great slip layer and saved me a couple of times, could it be? Do you see any negative correlation between hair and concussions? The linked video is interesting. Apparently air could provide decent protection. That got me thinking of this local brand called Egg (egghelmets.com). They make by far the coolest looking helmets out there but unfortunately currently only for kids. What it doesn't say on their website is that to make them fit snug, you inflate the liner after you put them on. There is a small bellow near your chin where can pump it up. Saves you the hassle of fiddling with that strap behind the head but could a solution like this also prevent concussions? I definitely need them to release adult helmets . I'd definitely be interested to try your Maya helmet but your dealer network is still limited in Europe. Nearest dealers are in France or the UK. So for the time being, I'd better keep the hair long (as a slip layer), don't mount large elements to the helmet (light or camera) and maybe get one of these Egg helmets when they're being released for adults (and still have an inflatable liner). @chadgmail: Thanks! Yes, we're definitely in it for the long haul. It has taken us a decade to get where we are now, and we're stoked to see some of that tech innovation starting to make it into mainstream helmet manufacturing. As awareness around helmet safety continues to increase, so will the advancements around concussion research. Got an interceptor, and unfortunately... I tested it within a month. Got a bit off line after hitting a 30 footer. Almost made it around the tree after landing, but the side of my head and right shoulder hit which snapped the right side of my body backwards, and then flung me down on my left side hitting my face on the ground. It all happened really fast, but I'm inclined to think the initial impact (tree, not ground) knocked me out. Sent the helmet back to Kali and received a replacement within a few weeks. only paid for shipping. Thankfully, CT scans of head showed no major concerns. I don't really know what to conclude other than simply: Real world crashes are incredibly hard to replicate and are unique and complex in almost every incident. I think Kali is on the right track, and will buy their products in the future. Side note, I also bought a Fox Proframe as I really wanted something with full face protection AND that is bearable on hot summer days here in the southeast. I just purchased the Kali Interceptor, and couldn't be more pleased with it, although I have not "fully" put it to the test yet in a crash. Kali is a company that is really taking a hard look at safety of helmets and publishing their findings. Kudos for that. Also, the crash replacement is pretty rad. Keep it up. 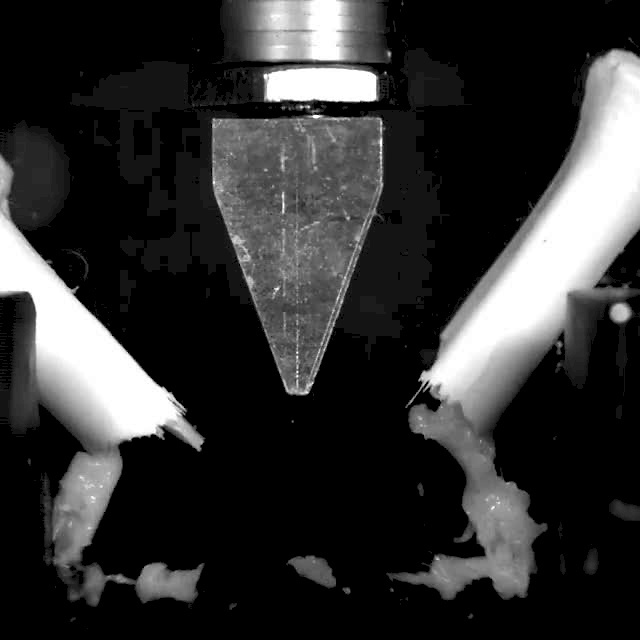 Oh man, seeing that 'bone' break and the goo ooze out. Very well made and helpful article, I only wish that PB would put more ones like this more often, it should be a key interest to deliver a scientific analysis of the actual phenomena which are part of the riding processes which we all enjoy so much, and with more importance of course, to the life-threatening, unfortunate events like crashes, which are an omnipresent risk, if you like it or not. Kali's view and results are a good example of transparency from a company towards its clients, and I think we can agree that we appreciate an initiative like this at any time being. Moreover, I don't think that they are not actually trying to research and deliver better gear for the well-being of their clients, and thus I consider that more companies should publish studies/results like these more often. Great article. One thing you mention is about the size of the helmet being a factor for leverage , the less the better. Don't 6D have a different view- that to have enough material to soak up an impact , the helmet has to be thicker/bigger to make this happen ? What would Kali say about this? We absolutely stand by our position - smaller and lighter means less leverage, which means a reduction in impact forces to your brain. We feel that that the best strategy is to combine both a reduction in helmet size and weight with advanced materials such as LDL and Nano Fusion. Hoping Kali will chime in here, what are your thoughts on a system like MIPS, seems like it is designed mostly around dealing with the rotational component but not the linear force? The awareness around rotational concussions would not exist as it currently does without the advent of MIPS. The MIPS system works, however, it only deals with rotational - as you point out. We're advocating that LDL can help mitigate both linear and rotational acceleration, in both high-G and low-G impact conditions. After still struggling with concussion symptoms more than a year after my crash, I really wish I had one of their helmets on. @KaliProtectives I have a lot of respect for the research you guys are doing and the technology behind your helmets is awesome, but, they are too hot. I need to wear a full face lid on my daily ride due to the level of risk in the features, but pedaling up in a helmet with moto-level ventilation just doesn't work. I really hope you guys are working on something like the Proframe, but better. Why do DH rated helmets have so much steel mesh and foam that impeads ventilation? I think they have a full face, but vented helmet, in the works, which will be released this year. I think there was an article on a short while ago on Pinkbike. Firstly, it is cringe-worthy calling this real-world data. This is accident reconstruction, minimal real world data gathered from the initial event. However, it is a cool reconstruction providing some insight to the dynamics of Rogatkin's crash. I was thinking that Red Bull should sponsor a study where all athletes competing in their events were required to wear a helmet outfitted with a 2-2-4 accelerometer array to gather true real world data. I'm certain this would be extremely useful for helmet designers(as well as ASTM) in developing new testing standards which are more representative of impacts seen in mountain biking, which are behind the times given all of the new studies on MTBI identifying new mechanisms of injury. There are a few additional points which should be known for the common folk, in particular that this science brain magic isn't extremely well known, and that we are still learning tons about MTBI mechanisms and injury thresholds. Who would have thought the brain is a complicated thing to study haha! I find it very interesting to directly reference the probability curves developed by Greenwald's(I think, references!!) study of MTBI in football without discussion of caveats in this study. Additionally, biofidelic response in FE models is questionable as most data that it is validated against is cadaveric, and tissue response can drastically change post-mortem. I am not arguing that mechanisms to reduce strain in oblique impacts are not beneficial (I believe they are very beneficial! ), but that there is a little more to the story. That said, this is a sweet article providing some discussion of how helmets really work, and how companies like Kali are trying to design the best possible product! I completely agree @ the sponsoring idea for studies. Nowadays in the research field, the main problem are the funds that a research require in order to be carried out. The rest of the aspects are usually well covered or can be found and managed more easily than the funding issue. Big sponsors like Red Bull, Fox, and other big companies could ultimately get more involved into a more medical oriented approach of the research, by supporting and getting in touch with medical professionals in this field too, although in combination with the companies' very own laboratories and measurements in some cases of course. The idea is that if these big boys sponsors can ultimately fund these researches, we would have more data to rely and study on many aspects. This is a thing in motorcycle helmets as well. Check out 6D helmets. 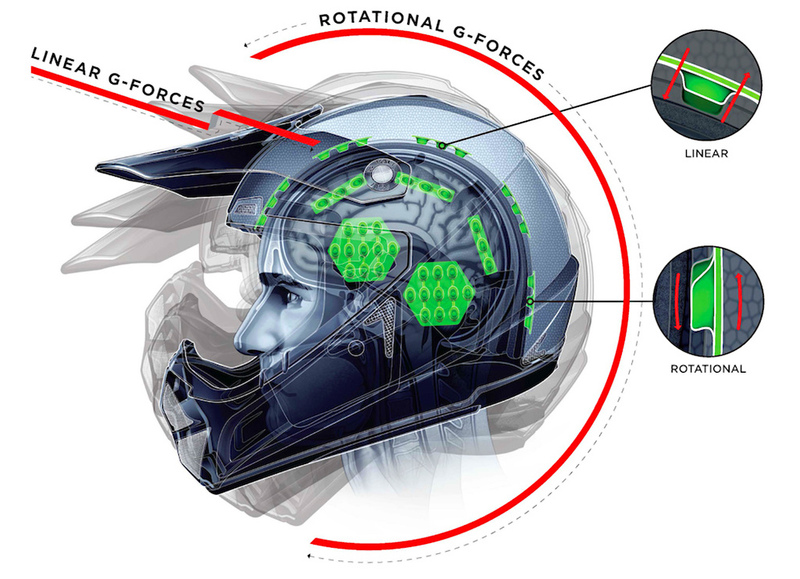 Essentially the goal of these designs is to reduce rotational impact forces to the brain, especially in motorcycles since rotatioal impacts are far more common (higher speeds). None of the DOT, ASTM DH, SNELL, etc tests actually test for rotational impacts, only head on impacts. Pun intended. I would like to see rotational impact protection standards in all helmets. The fact that most helmets still just use eps foam and a shell seems primitive. All the time and money invested in research to reduce helmet size and introduce other technologies to manage rotational forces, Kali must be delighted every time someone attaches a GOPRO to their helmets. After reading this, though the Rogatkin rampage crash showcases the amazing toughnes of the athlete, from the safety point of view it just seems like a darwinian facepalm. @kaliprotectives will you have a non dot approved lightweight fullface helmet with ldl soon? We will - we are releasing the Invader full face soon and re-releasing the Avatar, a sub 900g non-DOT DH lid. I was curious what would link concussions and low density lipoprotein, given the article seemed to focus on the human body. Seemed strange to me, but now i see... Go marketing buzz terms! I'm all for reasonable safety improvements, but could do without that. Hmm, how good does a test dummy, with what I assume is a rather sticky vinyl head and the helmet strapped to it as tight as possible, simulate the human head in this particular test? The hair and the scalp are already 'slip planes' around your skull and, for good or bad, most people don't strap their helmet on nearly as tight as I saw some testers do in a lab. I appreciate the (for a website article) considerable amount of unemotional information presented by you, but I think it should be noted that, due to the limitations of current test dummy anatomies, it's hard to tell how much of a 20% reduction in peak rotational velocity IN THAT TEST will actually transfer into the real world. We need better tests dummies. Seriously? You're complaining about a long, detailed, factual article about their helmet technology because it comes from the company? Who do you think would ever give us that kind of detail about a helmet if not the company itself? Answer: no-one. @MichaelLinehan: That would be a third party sanctioning body. 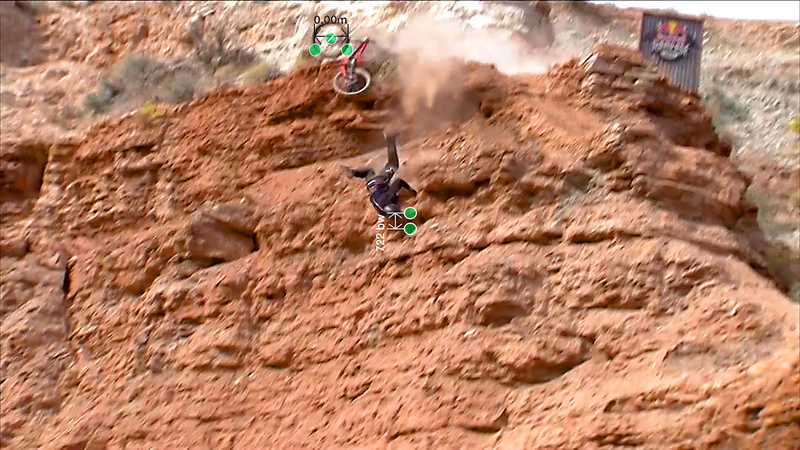 Which mountain biking definitely doesn't have for safety. That'd be a good idea though. Like SFI and FIA are to motor sports.